Since I’ve heard through the rumor mill that search engines and blog readers like bullet points, I’ve decided to toss Google a bone. 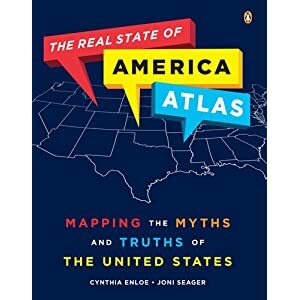 This post is a series of statistics from The Real State of America Atlas: Mapping the Myths and Truths of the United States. These numbers may surprise you. In 2000, 12 percent of Native American houses on reservations lacked complete plumbing. This situation is almost nonexistent in the rest of the United States. In 2009, 32 percent of Native Americans were living below the federally set poverty line. The matching statistic for whites was 9 percent. Subprime mortgage lending has led to many people losing their homes. 61 percent of African-American women who borrowed mortgages in 2005 received subprime ones. The matching statistic for white women was 22 percent. 53 percent of foreign-born residents of the United States are from Latin America. The national average number of foreign-born workers in the labor force is 16 percent. Meanwhile, 64 percent of United States newspapers reduced their coverage of international news between 2007 and 2009. It’s unlikely immigrants made those newsroom decisions. 61 percent of Americans surveyed said they were sympathetic to the environmental movement in 2010. As of November 2010, there were 1,280 Superfund sites in the United States in line for cleanup, according to the Environmental Protection Agency. Does sympathy equal action? Not necessarily. In 2005, women became the majority of motor vehicle owners in the United States. However, only 26 percent of auto industry employees are women. Women are also more likely than men to believe global warming is a serious concern. Guess who’s designing our cars?